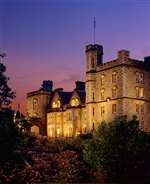 Inverlochy Castle was built in 1863 by the first Lord Abinger, near the site of the original 13th century fortress. In September 1873 during a trip to Balmoral, Queen Victoria spent a week at Inverlochy sketching and painting where she wrote in her diaries 'I never saw a lovelier or more romantic spot'. Tennis, Fishing on the loch, A walled garden, Clay pigeon shooting, Falconry display, Full sized snooker table.